Don't you just wish you were his hands? THE HAND HE DOES EVERYTHING WITH. And, I don't know why, but although the ratio of left handers vs. right handers in the general population is skewed signficantly in the right section (me!! ), the ratio of left vs. right in my celeb and real life crushes always seems to be about 50/50. WHY IS THIS? I can't figure it out. Do lefties turn me on? Secretly? Before I even know they write with their left hand? I always notice what hand they write with. IDK, whenever I see them write, I pause it. Is Brendan Hines a lefty? *laughs* Not only is he left handed, but they have Peter shooting with both his right and left hands...so he's kinda ambidextrous. Also, Walter's left handed, guys. It's another Bishop trait! That's really odd, then. So they do actually have him shooting with both hands? I wonder if that has been done intentionally. Peter weirds me out at times, he has too many talents. Check out caps. I think I went through the first page or so of the caps thread over here and saw one of right-handed shooting and one of left. He switches off. I'd say more left than right, but yeah, it's in there! I love that there's even discussion about this! I wonder what else he does with both hands. ANYWAY. Omg. I'm getting progressively more and more freaked out now as each episode ticks down to the final three. I REALLY have this horrible feeling that Peter is not going to fare well, and I'm so worried. Like, I don't think I will be able to actually accept if they killed him, even if they brought JJ back as a yellow universe Peter next season or something. Just, no. I desperately don't want any of our main three characters to die, but ugh, all the signs are just pointing towards Peter death. Do you all think he will use the Machine in the finale episode itself, or do you thik that maybe it'll get activated in one of the two prior to that and they are going to spring something massive and left field on us in the finale? I JUST DON'T WANT PETER TO DIE OKAY. I'm going to bawl my eyes out for weeeeks. Ugh. What if they finish us with that disgustingly evil cliffhanger of Walter clutching his son's chalk-white, broken body and mislead us to think Peter's gone, for the full frigging FIVE MONTH HIATUS. Wait, what have I missed?!?! Personally, I think the title of the last ep has to do with the First People...but I could be wrong. I don't know, what have you missed? Are you a spoiled one? If not, btw, some of the other threads may be a bit spoilerly. Have you seen the new set pictures that came out last week? I am a spoiled one. I don't know where to go find stuff, tho! I haven't been very into any fandoms ever since I graduated college, so this is my first time back to boards and tumblr, etc. I figure I can search on Google to find these pictures? The ones I'm referring to I have posted in the Stowaway thread. Have you seen them? We've also had confirmation from Joel that the Machine will get activated by the end of the season. Needless to say I don't know how well Peter's "other way" search is going to go. The best place for up-to-date spoilers would be the TWoP forums Spoiler thread. Here. I posted a timeline of as much info as I had personally come across also in the Stowaway thread last week. Obviously that was before the newest trailer for "LSD" (hee) came out. But, um ... they look scary. Also, there's a new pic from a fan who met JJ very recently. It was after those other set pics in the Stowaway thread were shot, and his ... wounds are on the opposite side of the face. Therefore, he's going to be hurt twice on two different occasions in - from what I can tell - episodes 3.20 and 3.21. And I doubt it's Machine related, because I suspect that will be kept for the season finale. I'm really worried. Okay, last post, then I'm going to bed! Seriously! UNF. I saw this pic on Tumblr and was haaaaappy. Honestly, I don't see them killing Peter...maybe he just gets lost for a bit! Think about it -- every season finale has had Olivia "lost" whether for an episode or a bunch. Maybe it's time to go rescue him! I love the idea of time travel. And I think that's what that first set is all about. I, too, have seen the casting spoilers, so, we'll see! But yeah. The prophecy never said he DIES, just that he has flamin' eyes. From what I've heard, they've built a loophole into the finale so that the alterverse is gone, but they can re-visit if need be. I'm wondering if this loophole ties into the machine bit. I seriously just wrote a bit about this. Hold on. "...and I can see every single second of it." And maybe this is part of it all? It'd be interesting, that's for sure! But again, I doubt we're losing Peter. And now I'm off to bed! kira wrote: Okay, last post, then I'm going to bed! Seriously! If only, right? I would kill for the scenario of having him use the Machine in the finale, repairing the two worlds, and somehow in the process transporting himself into a third, where he is totally alone and our team think that he has died operating the Machine. And then next season be focussed on Peter. 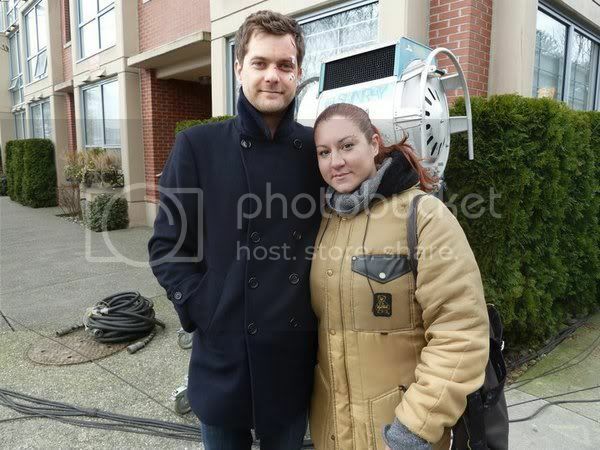 But then, of course, I am reminded that this is now the Olivia Show and I don't think Joshua Jackson would ever be gifted with that much screentime, considering he hasn't even been able to appear in like 6 episodes this season. Yeah, this is a good point. Only way really to get rid of the Alt verse without destroying it would be to have Peter fix the rift between worlds, or maybe destroy OUR world and transport our team into a third, leaving the Red verse healed. I truly hope you're right, I just have such a bad feeling. The relationship between Peter and the machine is reciprocal, Peter uses the machine and so the machine uses Peter. Peter doesn't belong in either of the worlds but in a way they're both a part of him. So, if Peter was to destroy one of the worlds, what if he lost a part of himself? Like the machine took it and destroyed it because it destroys every trace of that world. And if he makes a new one, the machine could take something from him in order to do it so it leaves him kind of incomplete, crazy even. He could be an absolute mess, the machine could tear down every wall he's built around himself and everything he feels just comes flooding out and he has no control, he's lost and confused and broken. OMG, Larissa, I just LOVE that idea! How fantastic and twisted...and something I could kinda see happening! I totally see this whole thing as this -- the machine is the giant eye in Mordor. And Peter's electromagnetic signature is the ring, and Peter's Frodo. *laughs* See? The ring wants to get to it's master, and will do whatever it has to do in order to get there. I am reminded that this is now the Olivia Show and I don't think Joshua Jackson would ever be gifted with that much screentime, considering he hasn't even been able to appear in like 6 episodes this season. I knoooow! He's the only one who doesn't have to, so I'm thinking he'll get tons of time in the finale. Good thing he still gets paid, right? I'm just so excited, I can barely wait, especially since I know some hurt is coming!! kira wrote: I totally see this whole thing as this -- the machine is the giant eye in Mordor. And Peter's electromagnetic signature is the ring, and Peter's Frodo. *laughs* See? The ring wants to get to it's master, and will do whatever it has to do in order to get there.